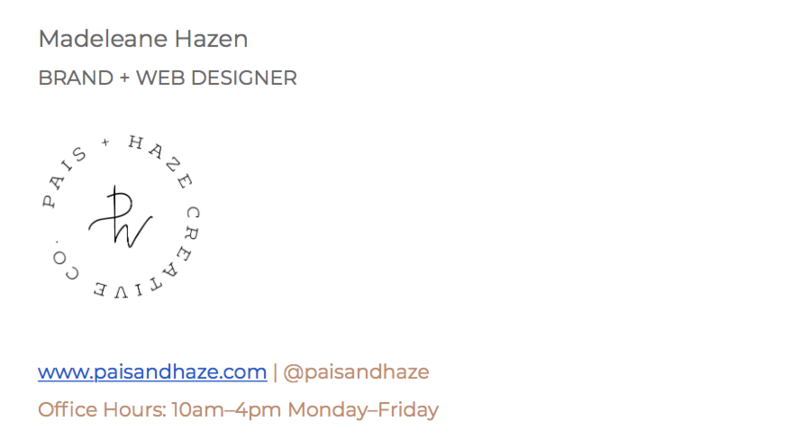 3 BRANDING TIPS TO IMPROVE YOUR ONLINE PRESENCE — PAIS + HAZE CREATIVE CO. When we brand a client, there are a lot of tiny steps along the way to make sure branding is cohesive and carried through every aspect of the business. There are 3 areas where I find businesses neglect to make easy fixes that will automatically make you appear more professional and on top of your game! I'm sharing these 3 tips so you can make these subtle but important changes! 1. YOUR EMAIL APPEARANCE // when you are emailing clients, appearance is extremely important. It's easy to overlook the simple things you should make sure reflect your brand. Create a customized email signature - SO important! This should include the basics like your name, position, logo, website, and social media link. You can also display your phone number and/or office/shop location if it's applicable for your business. Hyperlinks to each should be properly set up so that your email signature is a true resource for your clients and not just for looks. Not having an email signature is honestly less of a misstep than having a poorly formatted one! I've seen countless signatures with images that are WAY too large for the spot they're in, too much information just slapped on, and no particular styling to it overall. It's overwhelming to see it come through on every email and in that case it's better to just keep it empty until you can set it up correctly. BONUS! Creatively title your subject lines. This will not only come across as a breath of fresh and professional air to your clients every time they see an email come through from you, but it will also help YOU keep everything you send out cohesive! For example, I make it a habit to title all emails of a related type in all caps for the subject it's on, following by the business' name - which is a helpful tool for myself. Instagram highlight images - these are a new feature and not everyone has started doing these yet! I'm still working on the perfect ones for myself. But when you're ready, make sure they are created with your branding in mind, in the same font style as your logo is created in and using your brand's color palette only. Facebook page profile/cover - Facebook page's can be easily forgotten in this heavily Instagram run business world we're in right now. This definitely depends on your business since it's different for everyone, but my business personally uses Instagram much more so keeping my Facebook page's profile images up to date can get forgotten. The page's profile image is best for your primary logo, since it is a square format. For your cover image, use either a visual image of your products or even a photo of you at work. Doing a nice overlay of your logo on top of the image is very eye-catching as well. About/Bio's! MAKE SURE THESE ARE CURRENT! The very first thing anyone looks at when finding a business on Facebook (or person even) is the About section. Make sure this spot describes what you do and offer, even if it's nothing fancy. Make sure your links are accurate so that you don't miss anyone who comes by just because the link didn't work. On Instagram, bio's have become an area that is highly stressed over. Everyone is looking to make them unique and personal. While it is very important, don't stress over it too much! Speak from your heart so it sounds natural and simply describe what you do, who you are, what you offer, etc. Working with a brand designer such as myself, you can refine it even more. But if you're doing everything on your own, done is better than perfect! 3. YOUR WEBSITE // the most common little things I see on a website that can be easily fixed are the browser icon, website page url's, and broken links. Also while this should go without saying and no one is perfect, always check for grammatical errors! You can simply update your browser icon from the Weebly 'W', SquareSpace black cube, WordPress circular 'W', etc. to be one of your brand's logo symbols instead! Keep your website page url's simple and logical. When creating your pages, go ahead and be sure the page url matches what the page will be about rather than '.com/new-page' because then when someone asks for specific info you can easily shoot them the url it would logically be i.e. .com/pricing. Broken links are worse than anything! And yes, it's super easy for this to happen. Either you link to an external source and they change the url or you change your own url somewhere and the link breaks. It's frustrating, but just triple checking will avoid this. These steps take just a couple of minutes to implement and make sure that when a potential client sees your profiles, website, or email they are impressed and know exactly what you bring to the table! Let me know if you implement any of these steps!